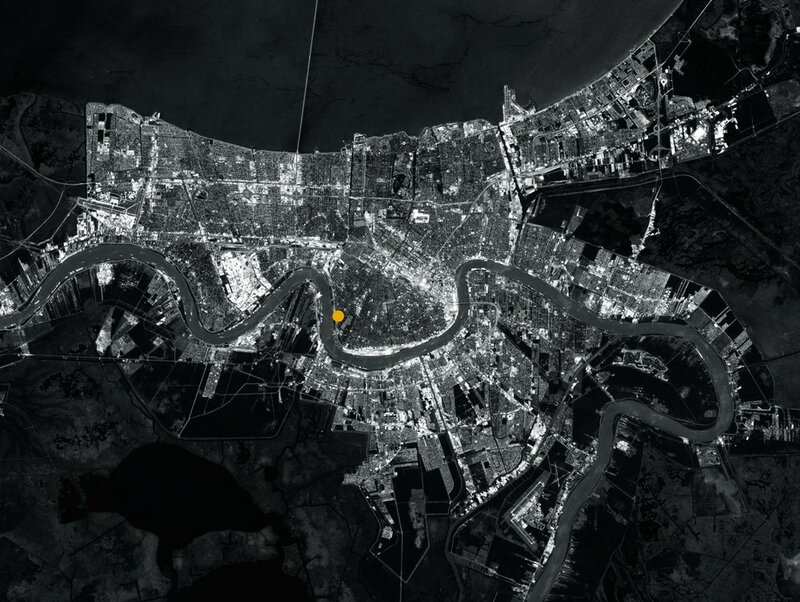 located amidst the domestic and industrial activities of new orleans’ riverfront and aimed at introducing a progressive, affordable housing type to an urban perimeter zone of the city, this two-family prototype capitalizes on vertical development to gain living space with expansive views. 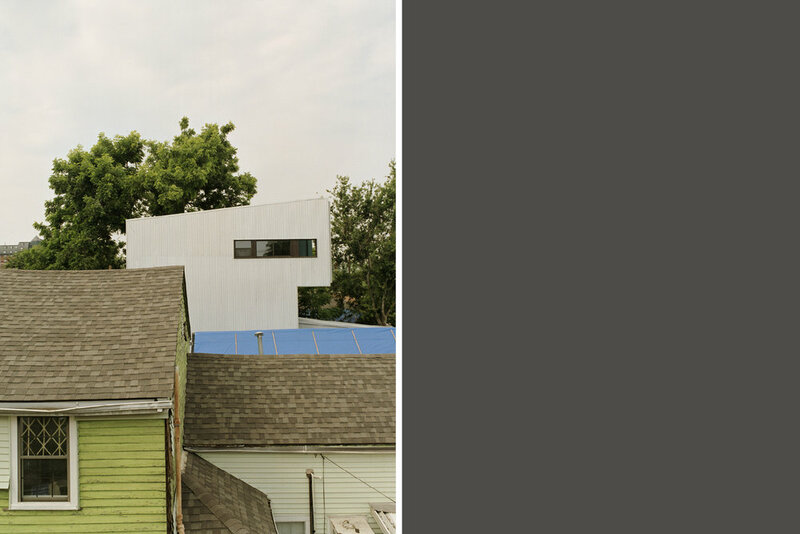 borrowing from the zimpel street strategy, this duplex incorporates a three-story vertical volume housing a larger unit with a horizontal volume that houses a smaller unit on the ground floor; this configuration minimizes shared party walls between adjacent units. again, the entry threshold is extended and the entry brought to the center of the lot in order to maximize efficiency of interior circulation. the project’s proximity to the nearby landscape of warehouses and wharves allowed bild to challenge traditional expectations for both form and material in residential architecture. the project’s proposal for the use of industrial materials in cladding, fenestration, railing, and garden enclosure are made not only in reference to the industrial language and activities of the river region, but in answer to questions of affordability, modularity, and maintenance. the design of this residence was already exploring solutions related to concerns about wet ground and the threat of water when hurricane katrina hit the city the day the final inspection was scheduled. 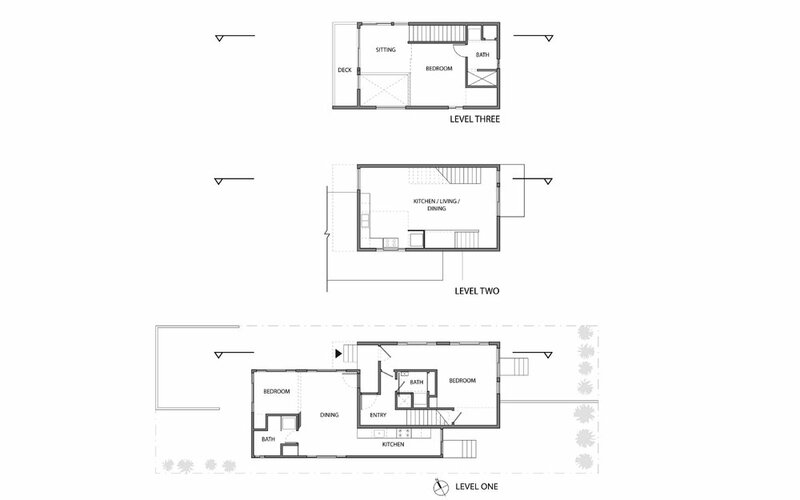 in an effort to reduce risk of potential floods, the design for this residence was developed with increasing reliance upon diagonal upward movement. the vertical configuration of the scheme also capitalizes upon and celebrates a desire to recapture and frame extended views of the city skyline and river, much like the schemes employed in the st. ann and zimpel projects.